The winners of the pomegranate sculpture competition have become known. The contest, held in two stages and was dedicated to the 650th anniversary of our classic outstanding poet Nasimi. The sketches sent to our email at the first stage were submitted to the jury. Based on the joint decision of a professional jury, the best sketches were selected. In the struggle of professional sculptors, the best was Vugar Guliyev , who perfectly conveyed the beauty and elegance of the pomegranate. The second place went to Chinara Bakhshiyeva and the third to Kanan Hasanguliyev. Winners of the first three places will be awarded with cash prizes and certificates. PPEAA thanks all participants who took part in the competition! is pleased to present you next contest. According to the Decree of Ilham Aliyev of 11.01.2019.
the great master of literature, the ingenious creator of the world famous poems. 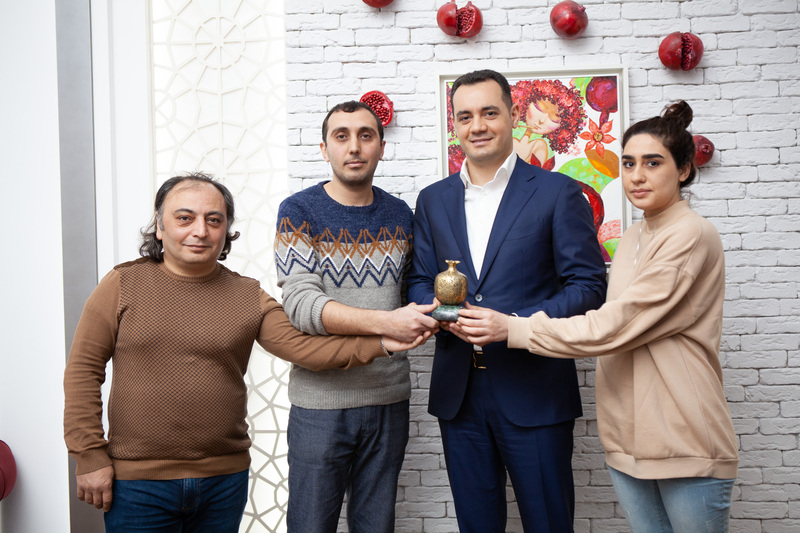 2019 year has been declared the «Year of Nasimi» in Azerbaijan. and proudly named the competition in honor of these immortal poems. Taking his power from the earth, our source pride, pomegranate attracts millions of hearts. create new unusual work of art, and share your work with millions of people. of pomegranate sculptures "In this world I cannot fit!" Sponsor: "XXI Century" (International Center of Education and Innovation ). Organizational support: Azerbaijan Export and Investment Promotion Foundation (Azpromo). The competition will consist of two stages! At the first stage, by sending a sketch on the topic “Live Pomegranate” to an email address ([email protected]), you can become a participant in the competition. At the next stage, the best sketches selected by a professional jury will be implemented by the participants. According to the decision of the professional jury, the participants who won the first three prizes will be awarded cash prizes in the amount of 2,000, 1,000 and 500 AZN in accordance with the place taken. 2. It is also important to include your name and contact number in the letter. 3. The sketch sent to the email address must belong to the sender. 4. Please note that the size of the submitted work should not exceed 30 cm. If you have additional questions about the contest, please call +994 50 711 70 77. PPEAA wishes success to all professional sculptors who will take part in the competition.